I take atheism to be a “lack of belief in gods”. A lack of belief does not lie in the realm of knowledge. Neither does it lie in the realm of the unknown. A lack of belief is silent about the state of knowledge about the subject in question. A lack of belief does not imply a state of knowledge. A lack of a belief is not in itself a logical negation of that belief. Many extend this and take atheism to be a denial of the existence of gods as professed as a belief by others. I suspect that most of my acquaintances who claim to be atheists use the latter definition when they present arguments to support their denial of the existence of gods to try and negate the beliefs of others. But a denial of some belief is then an attempt to shift something unknown into the realm of knowledge. It shifts the conversation from ” I don’t myself believe in X” to “I know that your belief in X is false”. This shift from the realm of belief to the realm of knowledge, I think, is incorrect, illogical and invalid. We are inevitably drawn into epistemology. 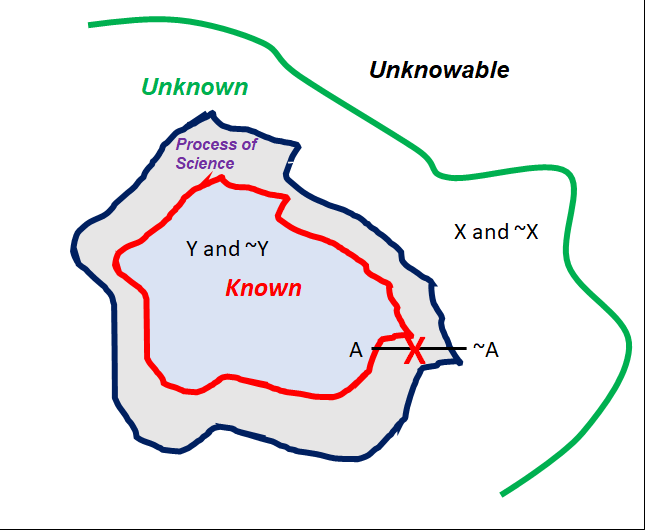 The known, the unknown and the unknowable. The known and the unknown are realms that are self-apparent. Science is the process at the interface of these regions which leads to the growth of the region of the known. All beliefs by definition lie in the region of the unknown. Any statement and its negation ( X and not-X) must both either lie in the region of knowledge, or both in the region of the unknown. It is not possible for one to live in the realm of knowledge and its negation to live in the region of the unknown. A belief in gods lies in the unknown. A lack of belief in gods (which is atheism) is not in itself a commentary on that belief. A denial of the belief in gods cannot then be anything other than belief and cannot shift into the realm of knowledge. A denial of a belief – which by definition lies in the unknown – is to claim knowledge of an unknown thing which is self-contradictory. Is some part (and maybe the major part) of the unknown then unknowable? Some scientists – and some atheists – would claim that the unknowable does not exist; that everything – eventually – can be explained. But I think they delude themselves. This trifurcation into the known, the unknown and the unknowable does not address who the observer is or the time element. “To know” requires cognition. Cognition requires a brain. Known to whom? when? for how long? What is “known” depends upon the brains alive to know. Facts which were once part of knowledge may become unknown, though they may well remain facts. I observe that most of past events are now unknowable, though they were once known. What was once known, may have first passed into the region of the unknown (but was still knowable) and then with the further passage of time may have passed into the region of the unknowable. Most of the past events in my own life are already in the region of the unknowable. The most basic questions of science that we can formulate always lead us first into the unknown and then into the unknowable. When the unknowable is reached we use labels. Gods, The Big Bang, Dark Energy, Dark Matter, …….. . But they are all just labels for Magic. But more fundamentally, the Great Unknowable – throughout all of space and all of time – is time and its nature. What came before time, when “before” was undefined, is unknowable. At the most basic level, our causal universe and all its laws and all our logic rely upon the existence of an inexorable and inexplicable Time Magic. (I take all events which occur but which are inexplicable to be Magic. It is my label for that which lies in the region of the unknowable). Beliefs in Gods or the Big Bang also lie in the region of the unknowable. Atheism is about belief and does not address the nature of knowledge or confront the unknowable. An atheist’s lack of belief in gods then lies in the realm of the unknown and perhaps in the realm of the unknowable (Magic). Even an atheist believes in Time Magic (whether he acknowledges it or not). This entry was posted on July 8, 2018 at 8:59 am and is filed under Philosophy. You can follow any responses to this entry through the RSS 2.0 feed. Both comments and pings are currently closed.